Beal is telling his own story — haltingly, slowly, incompletely. It’s part of the process of building trust, of getting over his issues. There’s a lot to get over, and much to tell about the pain-packed 40 years lived by the man born Shallah J. Beal. Some days he is upbeat, almost chatty. Others, he borders on morose, and a talk with Beal feels dark. He has his family (two daughters), a girlfriend and an apartment with his brother. Missing from that list: a steady job. “I didn’t go to school to work at McDonald’s,” he said, noting he’s taken civil service exams, but hasn’t found work. Over the summer, he found temporary work, doing manual labor with a demolition crew through Manpower, a staffing agency. But by summer’s end, the downtown project had been completed and local construction opportunities had declined. His biggest life challenge now is securing what he deems a quality job. “I call Manpower every Monday,” he said. He’s found several small construction jobs and warehouse positions that help cover the bills, but no steady work. He described a week of working overnight, unloading trucks or stocking shelves. This summer he also earned three certificates at the Syracuse Educational Opportunity Center, becoming OSHA-10, OSHA-30 and lead certified, all of which are construction health and safety trainings. 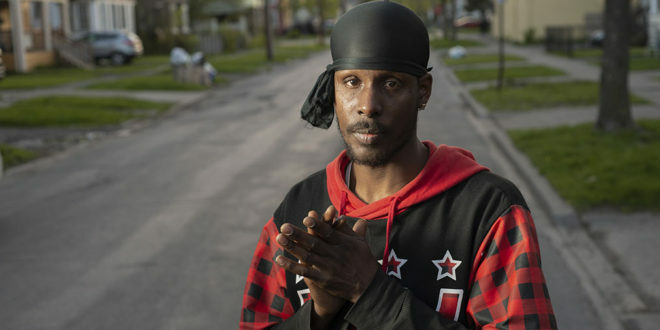 Finding a job is one of the hardest things for parolees like Beal, who was released from prison in 2016 after serving three years for assault. An Urban Institute study found that only one-in-three parolees had found a job within two months of release. And difficulty finding work is a key factor in whether a person released from jail is arrested again, the Bureau of Justice Statistics concluded in 2018. The bureau tracked more than 400,000 people released from state prison in 2005, and found that 83 percent were arrested at least once by 2014, according to its 2018 report. 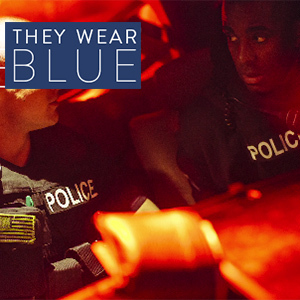 Blacks had the highest recidivism rates, at nearly 87 percent, and male parolees were more likely to be re-arrested than female, the study also found. Opening up helps Beal, though talking doesn’t come with a paycheck. It does inspire self-reflection and a measure of optimism. 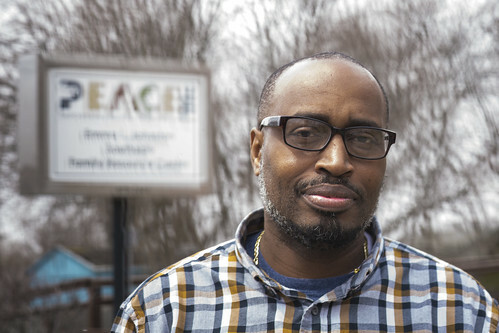 That’s part of the goal PEACE Inc., the local community-service agency whose primary mission is to help individuals and families living in poverty, has in engaging men like Beal. At PEACE’s Southside Family Resource Center, Beal speaks up around others at the encouragement of the center’s coordinator, Charles Rivers, who spent three decades in and out of prison. Rivers’ own journey has seen him evolve from a withdrawn ex-con to a confident advocate, comfortable leading groups of strangers through intimate discussions. Rivers says one of the hardest things to endure for ex-offenders is coming out of jail when there’s no family or friends to greet you, and nowhere to go. PEACE makes sure Beal has that, and a friend when he might think there is no one. Beal completed a three-year parole term at the end of 2017, and when he first arrived at PEACE, he was guarded and quiet. Many of the members knew him as someone who would come to PEACE to chat briefly with those he knew and then go about his business. But after some time, he took to more people and started to relax. He is still private. He was not comfortable with reporters visiting where he lives, preferring to meet at PEACE. He also promised to connect reporters with his oldest daughter. He never did. He says being jailed repeatedly, dealing with family and friends’ deaths and being away from his own children built the emotional walls around him. Middle school and puberty were tough for Beal. He was sent to a juvenile facility for defending his mom from her abusive boyfriend, he said. More assault charges followed. He was last charged for assault in 2013. Beal’s nickname comes from growing up in the projects of Brooklyn, New York, during the 1980s and ’90s. Those decades were the worst years to grow up in the city, Beal said. Crack, cocaine and PCP were all out of control. “It was hell,” he said when describing the drugs and killings that surrounded him. Born when his mother was 16, his grandmother assumed full custody. Beal credits her for raising him. His mom was one of 10 siblings. He has over 50 cousins. His household was always crowded — with an average of three people to a bed, he said. Beal has suffered a lot of loss. His mother died recently, and he lost several friends last winter and spring, including one who was shot and killed at a party in Syracuse. Beal said he had thought about attending the party. His first brush with trouble was at age 12, when he said he stabbed his mother’s boyfriend after one of the many times she was beaten. He said he doesn’t remember how many times he was sent to jail before he was given a chance in the summer of 1994 to attend Cayuga Community College. He received his associate’s degree in business administration. But he fell in and out of trouble again, the last time in 2013 when he was convicted for assault and gun possession. The three years in state prison that followed, combined with participating in programs and playing basketball, which Beal says changed his mindset. He knew he had to get out of the projects, get out from under a “black cloud” and start fresh. PEACE worked hard to support such efforts. Over the last year, the organization used a $95,000 state grant for a pilot program to help just-released offenders reunite with families in public housing, which has strict rules limiting who is allowed to move in. Experts acknowledge family support is vital to break a chain of repeat offenses. 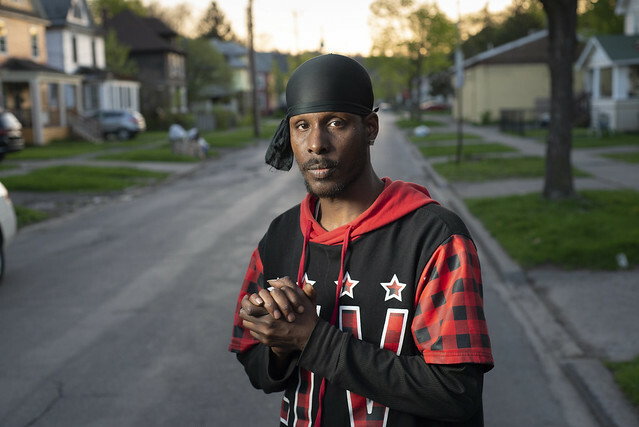 PEACE also used the funds to help people like Beal, who now lives with his brother in private housing, by preparing for a job with resume-building, setting up mock interviews or returning to school, according to the organization. PEACE also provides a place to go, to hang out, to remember good times and to reflect on positive experiences. Funding ran out for the pilot program in February 2018. The state is still reviewing the renewal application. Rivers said PEACE will continue its role whether or not the grant is renewed. Beal credits his strength of getting through his lows to memories of his late mother and his two daughters. But that is not easy. When he tried to get a job before — and again now — he becomes frustrated. “That’s when reality hit, and I had a reality check,” he said. He describes prison as a place where you activate “fight-or-flight” survival mode. He said he has had to re-learn what it meant to strive for things like a steady job. One threat to that “comfort” is being around the same things that got him in trouble in the first place. While he was incarcerated, Beal said he was around a lot of fighting, drugs and homemade alcohol. Beal has big goals for his future, his family and what he wants to achieve over the rest of his life. He has two daughters he talks to every day. His first-born is 22 years old and set to graduate from Buffalo State in May. “That’s my motivation,” he explained. His second daughter lives with his aunt in Brooklyn, and is just 6. He hopes that one day they can all be reunited and live happily together as a family. He wants to be someone they can look to. He is talking his way through it, feeling better.